Note: On-site room design services are currently on hold. If you’re interested in E-Design, go HERE. 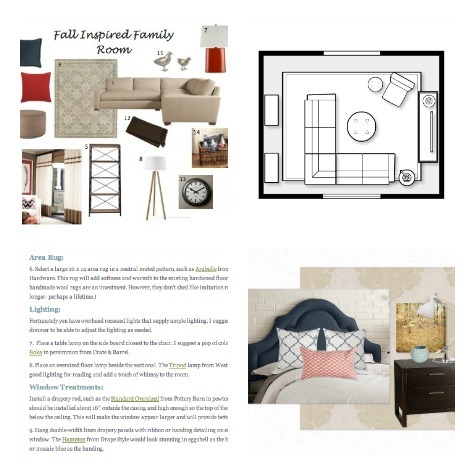 –> Imagine creating a room that truly reflects your life and style preferences. –> Need assistance with developing a plan of action tailored to your style and needs. –> Want to be involved in the design process, but need someone to take the lead. –> Feel overwhelmed by the choice of materials and finishes and don’t know where or how to start. –> Require assistance figuring out which existing elements stay and which ones need to go. –> Need someone to develop a plan with your budget in mind. –> Look forward to rolling up your sleeves and having fun implementing all or part of the plan. –> Require someone to call for support if you hit roadblocks during the process. Questionnaire & Pre-Assessment- Email us and we’ll send you a brief Prospective Client Questionnaire along with a few details. After you’ve submitted the questionnaire and we’ve both determined we’re a good match, we’ll agree on a time to meet for an on-site assessment. Analysis- After we receive your deposit, we’ll complete a Client Analysis on site (getting to know you, your style, budget, timeline, etc.) as well as a Room Analysis (what’s staying, what’s going, size, shape, attributes, etc.). In addition, we will continue to ask questions via email throughout the planning process to ensure we’re on the same page. Support- ½ hour phone consultation OR email support for one week following receipt of plans (average of one email per day). Additional Support (optional)- If you still have questions or require additional support in implementing the Satori Signature plan, we are available on an hourly basis. Please contact us for information about our fees and policies. Just need a mood board or space plan? We do that too! If you only require one, two, three… components of our room design plan, we have à la carte services. All of our packages are customizable to suit your needs.